Note : The older WH2000iXLT model has been updated to the Westinghouse WH2200iXLT (see above). Read our full review as we compare it to the Westinghouse iGen2200, a newer 2200W inverter generator from Westinghouse. 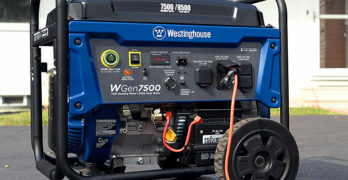 Westinghouse WH2000iXLT is an ultra-quiet inverter generator that’s half the price of the world renowned Honda EU2000i. The Westinghouse can hold it’s own when it comes to overall quality. How do you think the Westinghouse WH2000iXLT compares to the popular Honda EU2000i? Is this the right generator for you? What makes this generator special? Is the Westinghouse WH2000iXLT worth your money? We answer all of these questions and more. Perfect for all of your events and outdoor activities. ✓ View or download the MANUAL or the PARTS LIST. Video | How Quiet is the Westinghouse WH2000iXLT? The basic concept that powers any generator is the conversion of one form of energy into electrical energy. While most notes say that the initial form of energy is mechanical energy, you must understand that this mechanical energy needs to come from some source. The question that we really need to be asking ourselves is: How do we produce mechanical energy so that we can convert it to electrical energy? To solve this conundrum, people came up with various solutions. The first and possibly the simplest solution was the hand crank. It is however obvious that one cannot continuously turn a hand crank every time one needs electricity. In today’s environment where we need electricity for almost everything we do, using a hand crank is not the solution that we are looking for. The use of an internal combustion engine solved that dilemma. As can be imagined, the combustion in the engine needed fuel. The most logical choice was fossil fuel. That is how gas powered generators came into existence. The gas powered generators of today use gasoline, diesel or propane to function. The basic concept of the conventional generators has however remained unchanged. They still use mechanical energy and convert it into electrical energy. Invereter Generators: Are They Different From Gas Powered Genereators? Inverter generators are named after the basic additional function that they possess. A traditional generator (that is a gas powered generator) produces direct current. This is more popularly known as DC power. An inverter generator however inverts the DC power and changes it into AC power. The advantage of this is that the AC power can be produced at any desired voltage and frequency. This makes it useful for consumer level applications. Bear in mind that inverter generators are traditional generators that can produce AC power. This means that it has a lot of technology that a traditional generator does not possess. This makes it more expensive. Inverter Generators: Are They Really Changing The World Of Generators? Inverter generators are sometimes called I-Generators. Where ‘I’ stands for ‘inverter’ and is by no way related to the ‘I’ in the Apple products. A lot of people are saying a lot of good things about the Inverter generators but how many of those things are really true? Let’s do a comparison and find out. The traditional generators are designed to operate for extended periods of time. That is why they are larger and have much larger fuel tanks. This means that they can operate for longer periods of time without having to be refueled. Inverter generators on the other hand are smaller and are meant to be more portable. This means that they have a smaller fuel tank and thereby should have a shorter run time. There is however another point that one must consider and that is efficiency. Inverter generators have a more efficient fuel engine and they adjust their engine speed depending on the load placed on them. Conventional generators however operate at a 3200 rpm constantly. The engine speed does not change with the load. This particular feature of the increases the efficiency of the engine by 40 percent. This also translates into better fuel utilization. This means that you will get more out of the fuel that you are using. The increase in fuel efficiency also means a reduction in the exhaust emissions. This makes the Inverter generator more environment friendly. Rear view. Not much to see back here. One of the concerns that I find that most people have is the amount of noise that a generator produces. This issue is usually what draws people to the Inverter generator. In general you will find that Inverter generators are designed to be quiet. Sound dampening technology, quieter engines and sound mufflers have been incorporated to reduce the sound that these machines produce. When you compare this to traditional generators you will find a stark difference. Most traditional generators produce sound levels of the range of 65-75 decibels. That is in the same range as that of chainsaws and jet planes! Parallel Operation: What is it and why does it matter? Parallel operation simply means that you can connect two identical Inverter generator models together. When this is done you can double the amount of power that a single Inverter generator can deliver. Since the Inverter generators are small and easy to carry, two inverter generators can easily be carried and hooked up to each other. This would provide the same amount of power as one large generator would. The difference in the sound levels also makes this option tempting. We often fail to realize that a company is not just a brand. A good company with a good brand image is one that people have learnt to trust over time. Westinghouse has been in business for as long as 130 years. Its humble origins began way back in 1886 when George Westinghouse introduced the world to the alternating current electrical system. Today this system is more popularly known as the AC electrical system. In fact, if you go through the pages of Wikipedia, you will find that Westinghouse has been quoted because of their contributions in this field. Ever since this discovery, the Westinghouse company started developing solutions that helped power millions of homes across America. Their safe and efficient ideas made the natural leaders in the field. Today, Westinghouse not only provides power but also convenience to millions of businesses and homeowners. Excellent build quality, reliable and affordable. 1,800 Running Watts, 2,200 Peak Watts. Westinghouse 79cc 4 Stoke Engine. 13 Hours @ 25% Load. Less Than 3% Total Harmonic Distortion (THD). Easy to move around due to its light weight design. Double Insulated Acoustic Hood and Asymmetrical Fans makes it extra quiet..
Economy mode to save gas. Low Oil Automatic Shut Down. Sound Output, 52-59 dba NL/FL. Tool Kit and Oil Fill Measuring Container. View or download the Spec Sheet for the WH2000iXLT. The Westinghouse WH2000iXLT is a parallel capable digital inverter generator. Sounds very complicated doesn’t it? Let’s split that up so we can get a better hold of what it means. The term ‘Parallel capable’ means that the one Westinghouse WH2000iXLT device can be connected in parallel with another Westinghouse WH2000iXLT device. We have already delved into what that means so I won’t enumerate further. Phase 1: First it produces alternating current (AC) at a high frequency. Phase 2: The alternating current (AC) is converted into direct current (DC). Phase 3: The direct current (DC) is converted back to alternating current (AC) that is then supplied to electronic equipment. These three phases help ensure that power that is provided is ‘clean power’. This means that the current has a stable sine wave. This makes the current consistent. The three conversions that take place are the reason why the users inverter generators do not the same face voltage fluctuations that the users of traditional generators do. Dimensions giver the user/buyer an understanding of how portable a inverter generator is. Let’s take a look at the dimensions of the Westinghouse WH2000iXLT. The engine of any machine tells you a lot about what the device can do. 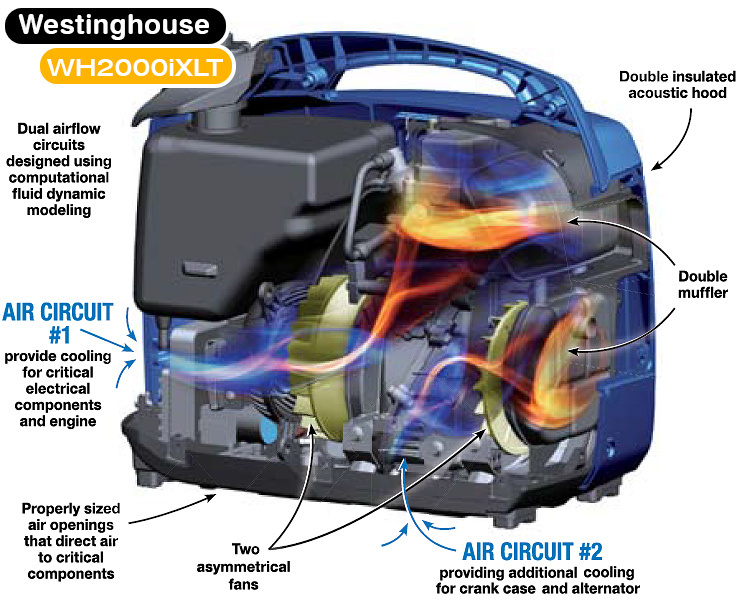 The Westinghouse WH2000iXLT has a four stroke, 79 cc OHV engine. The running wattage of the Westinghouse WH2000iXLT is 1800 watts and the starting wattage is just marginally higher at 2200 watts. The engine is started by using the recoil method. A glance at the outlets will tell you that the Westinghouse WH2000iXLT has a Duplex, a NEMA 5-15R 20V and a 12V DC8.3A. Another point that one must check is the fuel tank capacity. The Westinghouse WH2000iXLT fuel tank can hold 1.3 gallons of fuel. If you translate this into run time, it will mean that the inverter generator can run for 17 hours at 25 percent load. If the load is increased to 50 percent, the Westinghouse WH2000iXLT can provide power for approximately 13 hours. These three features aim at ensuring that the device runs at optimum efficiency. They also ensure that the Westinghouse WH2000iXLT is not used when the oil levels are low or when it is overloaded. These protective measures also mean that your maintenance costs reduce. Like all companies Westinghouse too tries to limit the noise that the inverter generator can produce. The Westinghouse WH2000iXLT has a double insulated acoustic hood and a dual muffler design. This helps ensure that the inverter generator limits its sound production to the 52-59 decibel range. Purchase a 2nd generator and run them in parallel to double your power. One of the best features that Westinghouse WH2000iXLT has to offer is the fact that it can be connected in parallel to another Westinghouse WH2000iXLT. To that however you need to have the requisite cable. In this case the cable is the Westinghouse WHPC 260041. It is a great replacement to bulky junction boxes that are used by some inverter generators. Bear in mind that this cable is meant to be used with Westinghouse WH2000iXLT and WH2400i inverters only! Here are a few alternatives for you to consider…. Quiet: Double Insulated Acoustic Hood and Asymmetrical Fans. Yellow Color Coded Touch points. High Efficiency Run Mode to conserve fuel. Low Oil Shut Down prevents engine damage. Can operate power tools while working outdoors. Can power all of these electrical devices, but not all simultaneously. If you need more power then opt for a gas generator. Ideal for campgrounds, construction sites, tailgates and power outages. Produces clean power which means it can safely run all of your sensitive electronics. There are two other inverter generators that are particularly noteworthy. These are the WEN 56200i and the Champion Power Equipment 73536i. Both the WEN 56200i and the Champion Power Equipment 73536i are lightweight inverter generators. This makes them extremely portable. The Champion Power Equipment 73536i is marginally lighter than the WEN 56200i by approximately 6 lbs. The specifications of both the WEN 56200i and the Champion Power Equipment 73536i tell us that there are few differences between both products. The Champion power Equipment 73536i has a higher running wattage which translates into higher fuel consumption. The WEN 56200i however does have a point in its advantage when it comes to noise levels. A 10 dBA difference in the noise levels between the two indicates that the WEN 56200i is definitely more soothing to the ear. Practical stackable design. Also can be run in parallel. WHAT’S THE VERDICT WHEN YOU COMPARE ALL THREE MODELS? Now that we know the dimensions and the specifications of the Westinghouse WH2000iXLT, the WEN 56200i and the Champion Power Equipment 73536i, it is easy to do a comparison. Let’s do a quick tabular review of it. A quick glance through the table will tell you that the Westinghouse WH200iXLT wins hands down as it ranks very high in all the right places. At 43 pounds it is highly portable and is over 10 pounds lighter than the WEN56200i. While all three have similar engines, the Westinghouse has remarkably high run time which supersedes the other two inverter generators. The larger fuel tank means that you have to refuel this generator at longer intervals. Even the noise levels of the Westinghouse WH200iXLT are extremely low, making this model a perfect choice. Why Buy An Inverter Generator? At the end of the day, the decision that you make boils down to why you are buying an inverter generator. Is it because you have frequent power shutdowns in your area? Do you worry about your food getting spoilt in case the power is cut off? Or is it just to run the heating/cooling system so you don’t freeze/boil to death? The size of Inverter generators is tiny when compared to their traditional counterparts. They are small enough to be portable and that makes things all the more interesting. Inverter generators are now becoming popular with people who love camping. In fact, they make life so much simpler that a lot of people are venturing out into the great outdoors because of them. Why? A portable source of electricity enables you to use your gadgets wherever you go. You don’t have to worry about charging your cell phone or your laptop. Gone are the days when you have to fumble and connect a variety of wires to your car battery just to make contact with the outside world. An inverter generator provides enough power that you can use your microwave on those wild camping excursions! It is obvious that inverter generators have made our lives easier. Finding one to suit your needs is not too difficult. A process of elimination is always the best way to go about selecting the perfect model! Visit the Westinghouse site to learn more.